EGDOC Inc is dedicated to ensuring that club and community members with special needs or disabilities have been considered. The following information details EGDOC Inc’s commitment to providing community access and inclusion. Two marked disabled parking spaces are available outside the gate of the rear parking area (indicated by orange rectangle in the image below). Those wishing to use the disabled spaces will need to access the car park via Coverdale Drive. Those attending class who may require assistance to unload their dog(s) and equipment can contact the club Secretary or President prior to class to arrange for a Committee member or Instructor to be available upon arrival. Access to the clubrooms is suitable for all. Flooring is at one level and there are two external entry points. One external doorway is larger than standard, another external doorway is of standard measurements and there is an internal doorway of standard measurements. Space within the clubrooms is limited and therefore not suitable for mobility scooters. There is a small step at entry to the toilets and there are no designated disabled toilets. There are two access gates to the Velodrome, one small (suitable for people) and one large (suitable for vehicles). There is a steep concreted decline/incline to access the velodrome. The main training field is grassed and uneven in certain areas. The grassed area is also known to collect and hold water in certain areas which affects the ground surface. Those attending class who may require assistance to get on to and off the velodrome can speak with an instructor or committee member who can organize assistance. Noticeboards displaying club information are accessible during class times. There are boards that are hung on the shed wall outside of the office with current information. There are also noticeboards within the clubrooms and office. EGDOC has its own website which contains a wealth of information about the club. Information on what to do during an Emergency is available on or near all doorways within the clubrooms and office. Those needing assistance in any way can approach our club instructors. These volunteers wear uniforms (usually red in colour) that clearly identify them as an instructor. Many club members voluntarily chose to wear club uniforms. These uniforms are usually red in colour and have the EGDOC logo embroidered on them. Those needing assistance can approach members who are wearing red and they can introduce you to an Instructor or Committee member. The clubrooms provide shelter from the elements as well as refreshments (some refreshments have a small cost). Please note the clubrooms can only accommodate a limited number of people at the one time. The clubrooms have a small kitchen and dining area that can provide protection, however, there is no air conditioning so it can become quite warm in the hotter periods. The kitchen can be used by members to have a biscuit and make tea or coffee. Soft drinks and chilled bottled water can be purchased for a small cost. The clubrooms, equipment shed and toilet block have verandahs which can provide protection from the elements. 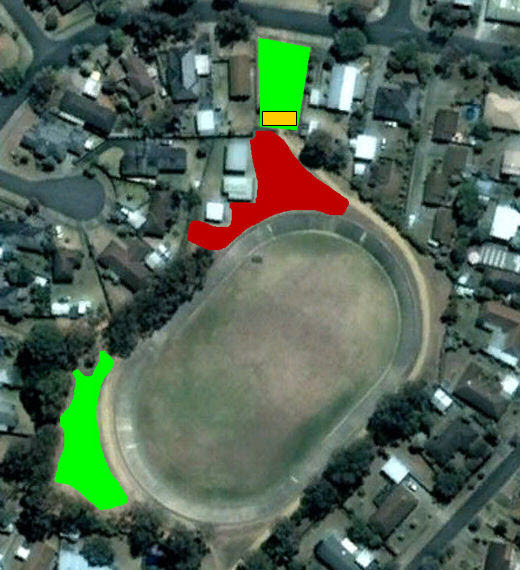 There are shaded areas provided by trees around the boundaries of the velodrome facility. There is no shade on the velodrome itself. For safety reasons EGDOC employs a heat policy. If the temperature on the Saturday ABC 7:00 pm News is forecast to be 35 C or over, all classes after 9:00 am on Sunday are cancelled. In temperatures up to 35 C, handlers are to use their own discretion. Note: The Club urges all members to consider their personal safety and that of their dogs in hot weather.